Two of the most active currencies lately have been GBP and JPY around the Brexit Referendum and this continues to be the case following the results. Sterling has been particularly volatile after traders mispriced the potential for a Leave win while JPY has been active as one of the leading defensive havens along with gold in 2016. The battles over what Brexit may mean for Britain and the world economy and between bulls and bears over the implications could particularly play out in this pair. 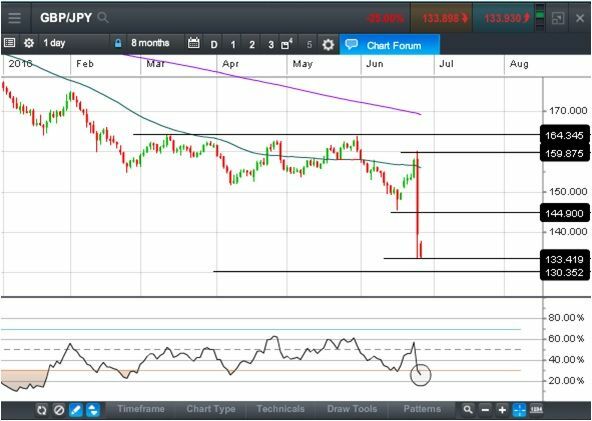 GBPJPY had been trending lower through much of 2016 although declines had paused somewhat between March and May. Following an early June decline on increased Brexit speculation, the pair then rallied on misplaced speculation that Remain would win. The final result saw the bottom fall out from under the pair diving from near 160.00 into the low 130s before stabilizing. This week started with the pair dropping back under Friday’s close near 140.00 suggesting continued pressure but this has been contained so far by Friday’s intraday low near 133.40. Should that fail the 130.00 level could be tested, a round number and a measured move down from its previous 145.00 to 160.00 range. A move back above 140.00 would be needed to signal a recovery turn with next resistance near 145.00. There were a lot of doom and gloom comments from unelected officials and third parties in the media and in the market over the weekend that may have put initial pressure on the pound. Comments today from elected officials like UK PM Cameron, UK Chancellor Osborne, Germany Chancellor Merkel and Leave spokesperson MP Boris Johnson, it appears that cooler heads are likely to prevail, that nothing is likely to happen until a new PM takes over and that Brexit negotiations will likely occur under an orderly process over time and that Britain isn’t going to be as isolated as some would like to think. While we may still see big swings in the pair though the week as traders figure out new levels, we may see new trading ranges emerge. It’s also important to remember that the last thing other central banks particularly the Bank of Japan and ECB want is to see a much lower pound making the UK more competitive, exporting deflation to them and undermining their stimulus programs. So at some point traders may find a floor or run the risk of having on imposed on them by central bank intervention. It has now been five months since the Bank of Japan introduced negative interest rates and since then, it has been monitoring the effects. This week a number of major economic reports are due for Japan including employment, inflation, retail sales, manufacturing PMI and construction. These reports may give a better picture of how the Japanese economy is responding to stimulus and if the Bank of Japan may come under pressure to do more this summer.